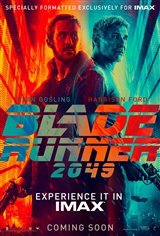 Set more than three decades after Blade Runner, Los Angeles Police Department officer K (Ryan Gosling) works as a Blade Runner, catching and decommissioning replicants on the run. But his latest case leads him to discover a secret that could pelt the remnants of society into total chaos. He must now try to locate aging Rick Deckard (Harrison Ford), the original Blade Runner, who has been missing for 30 years. Deckard's past intertwines with K's future and the future of all humans and replicants alike.